It’s a synthetic opioid, similar to heroin, but physicians can prescribe it legally. It is most frequently is prescribed for patients dealing with severe chronic pain, but over the past few years, increasing amounts of fentanyl derivatives have been manufactured illicitly and sold on the street. The US Centers for Disease Control and Prevention estimates that of the more than 64,000 US overdose deaths last year from any drug, more than 20,000 were attributed to synthetic opioids, many of them related to fentanyl and its variations. Pharmaceutical fentanyl is an opiate drug that is 50 to 100 times more potent than morphine. It is usually administered to patients in severe pain through injection, a patch or a lozenge. For example, the chemical difference between fentanyl and carfentanil is just a few molecules. But the difference in potency is significant: Fentanyl is up to 100 times more powerful than morphine, but carfentanil is up to 10,000 times more powerful than morphine. Carfentanil is used as a tranquilizer for large animals like elephants and has been blamed in fatal drug overdose outbreaks in Ohio and West Virginia. Illicit drug makers change compositions so that if they are caught with the drug, they technically have a different chemical compound from fentanyl or some other already regulated compound. The idea is to get around the law. So the Drug Enforcement Administration is constantly adding new variations to its list of controlled substances. It’s a cat and mouse game. Why add these fentanyl variations into the mix? Because they are so potent that it just a little bit can be cut and mixed into other drugs such as heroin or pills, stretching out the supply. Consider that you can buy about a kilogram of black-market fentanyl or a derivative online for about $8,000. 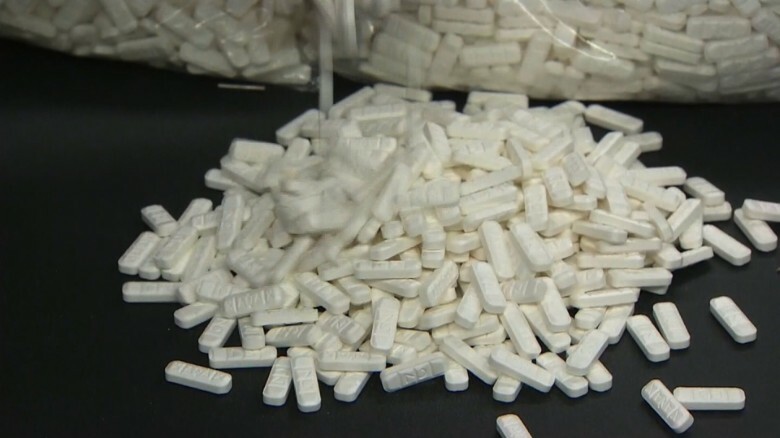 That can be used to cut 1 million pills, and on the street, those pills can bring in a total of $20 million to $30 million. But that potency can also be very deadly. An amount you can’t even see can kill you. There’s also no real quality control over the final drug. One batch may have the fentanyl evenly distributed throughout, while another may have some pills with much higher concentrations of fentanyl than others. According to US law enforcement, most illicit fentanyl is coming from China, where weak regulations and poor monitoring have created an environment ripe for underground labs to thrive. Illegal fentanyl and the chemicals to make it can be easily bought on the internet. Most are shipped into Mexico, where they are further processed before they are smuggled over the border. Sometimes, these drugs are shipped directly into the US. It’s a major challenge for US Customs and Border Protection agents. In fact, according to the agency, it has had to change its drug testing protocols to prevent accidental overdose from inhalation or absorption through the skin. Of the 328 air, land and sea entry points into the US that the agency oversees, at least 15 locations, including some along the US-Mexico border, now have naloxone, the opioid overdose antidote, in case of accidental overdose. However, not all offices are equipped with the field testing equipment needed to determine whether agents are actually handling fentanyl. Law enforcement officials say that at the moment, the government can’t effectively identify which packages to inspect because so little tracking information accompanies international mail bound for the United States. Packages sent via private couriers such UPS and FedEx come with information such as who sent them, transit stops the package made and who it is bound for, but only about half of all packages that come into the US carry that information. Bills currently in Congress aim to increase oversight of international packaging to help track their origins.